My first cookbook came out in 2004. Since then I’ve written one more (Passover) plus some new recipes for the second addition of Soup-A Kosher Collection. But in in addition to the books, I’ve developed lots and lots of recipes for newspapers, magazines, my blog and recipes that haven’t been published anywhere but I use all the time at home or at work (Desserts Plus ). I’ve been talking about the next cookbook for ages, but life keeps delaying things. So the other day I decided that enough was enough. It’s time to just get it done. 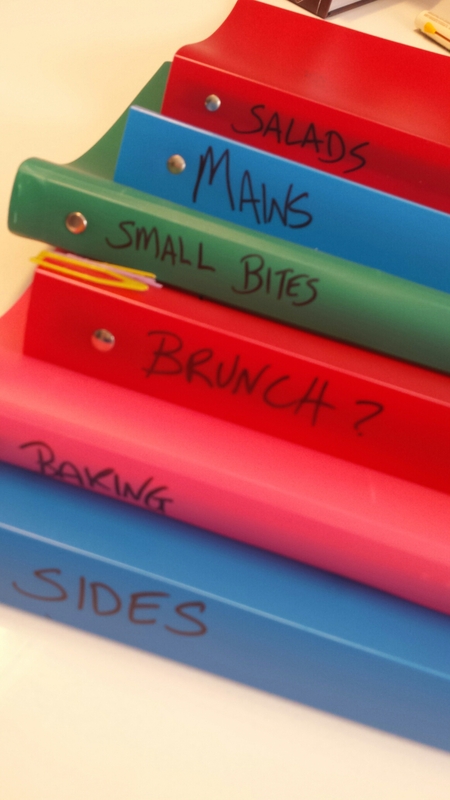 I opened the program where I store most of my recipes and printed them off, organized and categorized them. It’s going to take time to get even one done, but I have a lot of great recipes to work from for a number of books. Between working 10+ hours a day, the holidays fast approaching and trying to sell my condo and hopefully move, there isn’t a lot of extra time to work on recipes, but just know that I am. So many people have asked me when the next book will be available. I don’t know for sure, but I do know that I’m committing to squeezing out time to test and test and test and get the next one out there. And then the next! ← Too busy baking. .